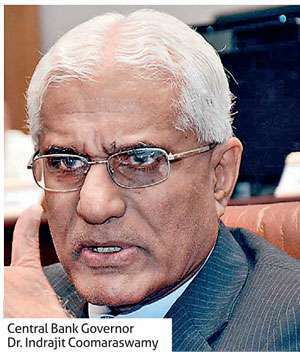 The Monetary Board of the Central Bank of Sri Lanka (CBSL) at the last policy review of the year decided to maintain policy interest rates at their current levels, as the private sector credit growth keeps accelerating and pressure on external reserves continues despite the economy performing below its potential. Accordingly, the Standing Deposit Facility Rate (SDFR) and Standing Lending Facility Rate (SLFR) of the Central Bank will remain at 8.00 percent and 9.00 percent respectively. “Although inflation remains subdued and economic growth below potential, the Monetary Board of the Central Bank was of the view that it is appropriate to continue the current monetary policy stance to stabilise overall economic conditions and domestic financial markets in a context where there has been an uptick in private sector credit as well as continued pressure on external reserves,” the CBSL stated. The CBSL urged the government to fast track the implementation of structural reforms to support economic growth in 2019, as the real GDP growth is likely to further slowdown in the last quarter of this year. “The real GDP growth is likely to be low in the fourth quarter of 2018 as well, before picking up gradually in 2019. The continued low economic growth reemphasises the need for implementing broad based structural reforms without further delay,” the CBSL stressed. The economy recorded a less than anticipated real GDP growth of 2.9 percent Year-on-Year (YOY), during the third quarter of 2018 while the revised growth for the second quarter stood at 3.6 percent. The CBSL was originally targeting 5 – 5.5 percent GDP growth this year, which was later revised to 4 percent. Meanwhile, the CBSL noted that the year-on-year growth of credit to the private sector has accelerated since last September despite the increased cost of funds and tight liquidity conditions. Credit to private sector grew by 16.2 percent YoY to Rs. 5,509 billion in November, which was above the CBSL targeted rate of 15 percent. Furthermore, net credit to the government and credit to public corporations also accelerated in November. Despite infusing around Rs. 90 billion liquidity to the banking system by reducing the Statutory Reserve Ratio (SRR) at the last Monetary Policy Review in November, the CBSL stated that the rupee liquidity deficit has further widened. The rupee has thus far depreciated by 15.9 percent against the US dollar up to 27 December (during 2018) despite measures taken by the CBSL and the government, including open market operations and import restrictions. The gross official reserves have fallen to US$ 7 billion at the end of November 2018 compared to US$ 7.2 billion mid November. “The widening trade deficit, tight conditions in the global markets and excessive speculation in the domestic market exerted pressure on the exchange rate, and the Sri Lankan rupee depreciated by 15.9 percent against the US dollar thus far during 2018 up to 27 December,” the CBSL stated. The CBSL expects that imports would moderate in coming months, in response to the measures adopted to curb imports of motor vehicles and non-essential goods as well as the impact of the depreciation of the rupee. However, the trade deficit widened further in the first ten months of 2018 with the expansion in import expenditure, outpacing the growth of export earnings. In terms of inflation, the Central Bank projected that inflation would remain below 5 percent on average in 2019 and stabilise in the range of 4-6 percent thereafter with appropriate policy adjustments. “Recent downward adjustments to fuel prices and selected administratively determined prices, as well as the reduction of special commodity and telecommunication levies, along with the ongoing recovery in the agriculture sector are expected to impact inflation favourably in the near term,” the Central Bank stated. However, the Central Bank noted that volatile global commodity prices, possible weather-related disruptions to domestic supply chains due to unpredictable weather patterns, and the possible pass-through effect of the rupee depreciation in recent months to domestic prices pose risks to the inflation outlook.